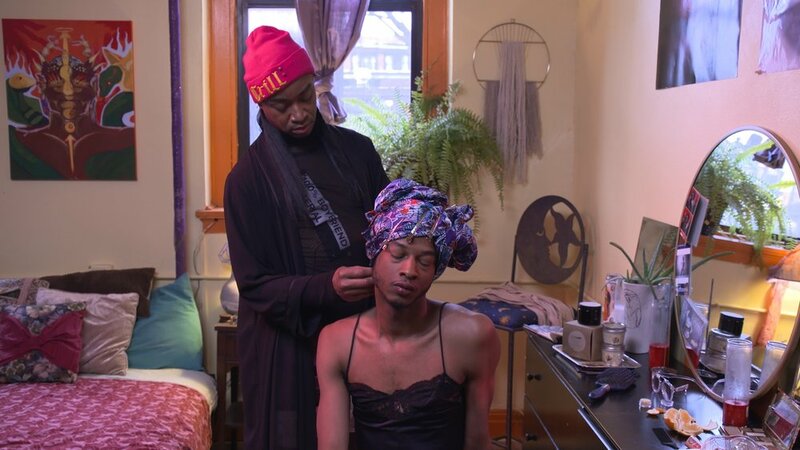 Hair Story follows residents of a Chicago co-op as they narrate stories of transformation while a drag queen styles their hair. The series is an experiment in series development, how to use one series to pilot multiple series by intersectional artists. In the series, every episode focuses on a different character, serving as a pilot for a series by that writer. Teaser trailer for "Hair Story." In "Hair Story," the pilot for Serial Dreamer, we meet the residents of the Chicago co-op during their annual meeting where they have to sort out all their issues. We learn that Gia, acting president, has been doing hair for side money. Her friend and client Curtis interrupts her meeting to recount a dream they had about her. There's shade, reading, and drama! We see Curtis' dream about Gia as she works to heal herself after a shady attack, set to Roy Kinsey's "B-SAYF." Supported by the Propeller Fund (Warhol Foundation) and 3Arts (Joyce Foundation). For development background, including early fundraising efforts and an introduction to the writers and characters, visit link above. Serial Dreamer takes me back to the origins of Open TV (beta). I moved to Chicago knowing little except that I wanted to do innovative research and find community. For more than a year I was lost, depressed, and lonely because my partner was in Hollywood and I was in an intellectual slump trying to transform my dissertation into the book. I slowly found my way out of this depression by finding queer community through Chicago’s art and nightlife. Serial Dreamer: Hair Story starts with Gia, played by Saya Naomi, whom I met as a drag performer in nightlife and co-starred in my directorial debut, Nupita Obama. The pilot expands her story to include the many characters created by writers who have joined me on the journey to developing Open TV. Co-Op introduces each of these characters at a tense co-op board meeting and gives a glimpse of their dream worlds. The following artists will be contributing their own characters: Aymar Jean Christian, Roger Fierro, Felicia Holman, Abra Johnson, Phillip Lambert, Jr., Jordy Marilyn, Elijah McKinnon, Meida McNeal, Saya Naomi, and Ashley Ray-Harris. Serial Dreamer is an ambitious experiment in queer TV development: a series of pilots about intersectional characters. In the full series, each episode focuses on one of the co-op residents and we follow them in their everyday lives and jump into their dreams. We see these dreams and histories as characters talk to Gia while she does their hair. Inspired as I was by dreaming while running to music, I imagine these worlds as music videos embedded in a serial narrative, but that may vary based on each artist’s vision and resources. Each episode will have the same cinematographer but different directors and creative teams. Characters may show up in other series, or not. The relations in the show will be as organic as relationships in the real world.